The Dandie Dinmont Terrier Club of Canada hosts regular events, both for our members, and to introduce the breed to the general public. Every two years, the DDTCC holds a Specialty show. 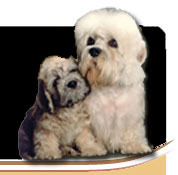 A Specialty is a dog show, only for the Dandie Dinmont breed. Sometimes the club holds its specialty with an all-breed club, and sometimes it holds the show as a unique, stand-alone event. Occasionally, throughout the year, the DDTCC will hold “booster” events. A booster is always held with an all-breed show. Our Dandie club undertakes to “boost” the number of Dandies entering the show by giving special prizes or rosettes. Each year, the DDTCC hosts a Scottish Dog show – an exhibition of the 13 Scottish breeds, held with the Highlands of Durham Scottish Games in Uxbridge, Ontario. This is an opportunity for the public to meet, and cuddle a Dandie Dinmont in our famous “cuddling parlour”. For our members, the club usually holds it’s annual “Fun Day”, (our club picnic and games day) on the same day as our Annual General meeting. For our members, the DDTCC holds grooming clinics and seminars.